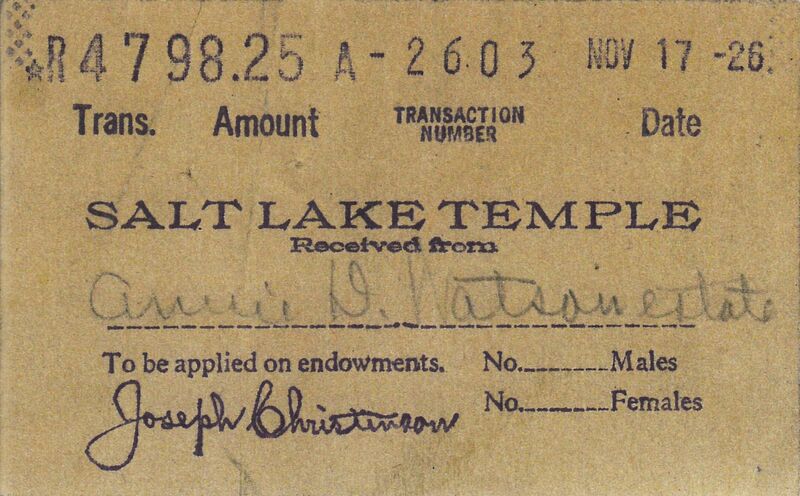 Until the 1940's, it appears patrons were paid a small amount for doing Temple work for non-relatives. Members would donate to the fund if they didn't live near a Temple or couldn't do work for their own ancestors, and when someone else with more time than ancestors was able to do the work, they would get $.50 or so. Interesting. So you are saying that it has already been on the MLS list for "Other" since July? Hadn't noticed it. It's not a new program, but it doesn't seem to be widely publicized. I know in the Houston Temple most lost-and-found money is donated to the Patron Assistance Fund, and has been for over a year (provided, of course, that the money is a small enough amount that the patron is unlikely to come back for it). So if you've dropped a quarter in the Houston Texas Temple in the last year or so, you've contributed to the PAF. My colleague in the cubicle next to me expressed chagrin when the announcement was made yesterday. It seems she has been wanting to do a story on it for a while now but has not been permitted. So when does Spanish Fark get a temple? I think the apple orchard near my house would be a good place. I realize that there is already one in neighboring Draper and two in South Jordan, but hey, Sandy doesn't have one yet.